“…LORD teach US to PRAY…” Luke 11:1 If you love to pray, or you need to pray more effectively, this book will change your prayer life forever. Your entire approach to prayer is about to improve! Imagine eagerly awaiting your prayer time, praying with confidence, and having your heart full of faith as you commune with God. This book is a gold mine of tools you need to have the prayer life you know you want and need. Gives you practical steps to immediately improve your prayer life. Helps believers connect with God daily. Turns your times with God into occasions of great joy! Includes a helpful Daily Prayer Guide. Is good for small groups with practical application throughout. Today is the day you can begin to touch God like you never thought possible. Daily Prayer Guide and Small Group Study Lessons included! 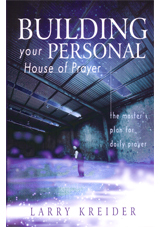 This book is an update of Your Personal House of Prayer. It contains an extra chapter on praying for revival.